The Bulldogs, who went to the NCAA championship game last season, easily handle the Black Bears. STARKVILLE, Miss. — Teaira McCowan had 18 points and 11 rebounds in her seventh double-double of the season, and No. 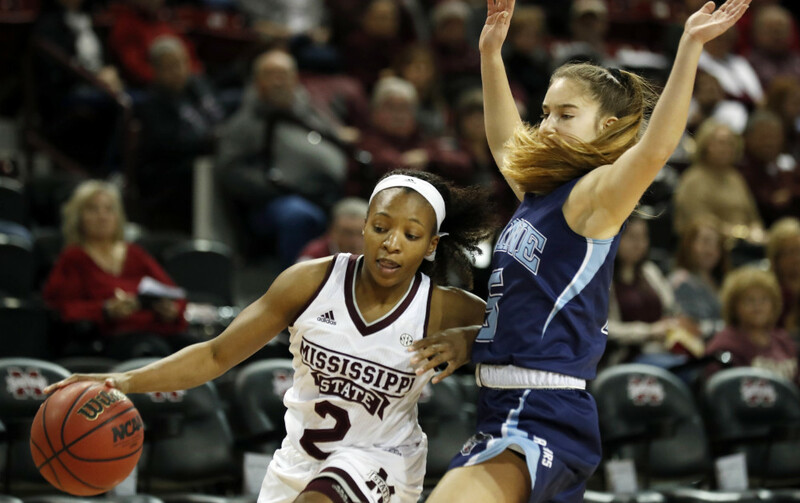 5 Mississippi State beat Maine 83-43 on Sunday. The Bulldogs (11-0) shot 50 percent or better for the second straight game as they knocked down 31 of 62 shots. They held Maine to 32.7 percent from the field (16 of 49). After closing the first quarter with an 18-4 run to take a 29-12 lead, the Bulldogs kept their momentum in the second quarter. Maine went scoreless over the final 6:11 of the half and trailed 45-18. Blanca Millan led the Black Bears (6-5) with 13 points. Maine had 27 turnovers, leading to 29 points for Mississippi State. (2) NOTRE DAME 91, DEPAUL 82: Jessica Shepard scored a career-high 39 points and the Fighting Irish (10-1) withstood a 3-point barrage by DePaul (7-4) in a win at South Bend, Indiana. Shepard, who twice scored 35 points for Nebraska before transferring, hit 17 of 22 shots and had 11 rebounds. Arike Ogunbowale added 21 points for the Irish – 19 in the second half. DePaul made 13 of 36 3-pointers. Ashton Millender led the Blue Demons with 18 points. (3) LOUISVILLE 87, KENTUCKY 63: Asia Durr scored 32 points, Myisha Hines-Allen added 18 and the Cardinals (13-0) built a 47-25 halftime lead on their way to a win over the Wildcats (8-4) in Lexington, Kentucky. (4) SOUTH CAROLINA 99, SAVANNAH STATE 38: A’ja Wilson scored 26 points and the Gamecocks (10-1) routed visiting Savannah State (2-7). South Carolina started the game with only nine players and lost guard Doniyah Cliney to a foot injury in the first half. The team announced that senior guard Bianca Cuevas-Moore is out for the season because of a ligament injury in her left knee. (7) TENNESSEE 90, LONG BEACH STATE 61: Anastasia Hayes and Meme Jackson each scored 15 points and the Vols extended their season-opening winning streak to 11 with a victory at Long Beach State (2-8). (8) TEXAS 87, (12) FLORIDA STATE 72: Brooke McCarty returned from a hip injury to score a season-high 24 points, leading the Longhorns (9-1) over the Seminoles (10-1) in Austin, Texas. (9) OREGON 90, MISSISSIPPI 46: Sabrina Ionescu tied an NCAA record with her seventh career triple-double, and the Ducks (9-2) beat the Bulldogs (9-2) in Eugene, Oregon. Ionescu, a sophomore guard, had 21 points, 14 assists and 11 rebounds. (11) UCLA 77, SETON HALL 68: Monique Billings scored 17 points and Kelli Hayes added 15 to help the Bruins (8-2) beat the Pirates (7-3) in South Orange, New Jersey. ST. JOSEPH’S (Pa.) 72, MAINE 59: James Demery had 19 points and 10 rebounds, Shavar Newkirk also scored 19 points and the Hawks (5-5) beat the Black Bears (3-9) in Philadelphia. Isaiah White made five 3-pointers and finished with 21 points for Maine. Aaron Calixte added 14 points, Ilker Er had 13, and Andrew Fleming grabbed 11 rebounds. St. Joseph’s quickly stretched a 30-27 halftime lead to 12 points as Newkirk and Pierfrancesco Oliva knocked down 3-pointers. WOOSTER 65, ST. JOSEPH’S 57: Spencer Williams scored 22 points and started a late 10-2 run that carried the Fighting Scots (6-3) past the Monks (4-4) in the Mauro Panaggio Tournament in Daytona Beach, Florida. The game was close throughout, with neither team leading by more than four points until the final four minutes. St. Joseph’s led 51-49 after a jumper by Aaron Hall with 7:04 left, but Williams tied the game with two free throws and put Wooster ahead for good with another free throw. Darian Berry was the only player in double figures for the Monks, finishing with 18 points. (5) ARIZONA STATE 76, VANDERBILT 64: Tra Holder scored 25 points, Shannon Evans II added 15 and the Sun Devils (10-0) overcame a dismal start to beat the Commodores (3-7) in Tempe, Arizona. Arizona State fell into a 13-0 hole, but used a 26-3 run starting late in the first half to turn what started out as an embarrassing performance into a runaway. (7) NORTH CAROLINA 78, (20) TENNESSEE 73: Kenny Williams sank a go-ahead 3-pointer with 35 seconds left as the Tar Heels (10-1) used a 9-0 run in the final minute to rally past the Volunteers (7-2) in Knoxville, Tennessee. Joel Berry II scored 21 points for North Carolina. Williams and Luke Maye added 15 points each. Tennessee led by as many as nine points in the second half and was ahead 70-67 before North Carolina took control down the stretch. (21) BAYLOR 118, SAVANNAH STATE 86: Jo-Lual Acuil had career highs with 31 points and 20 rebounds and the Bears (9-2) went on a 21-0 first-half run to rout Savannah State (3-10) in Waco, Texas.